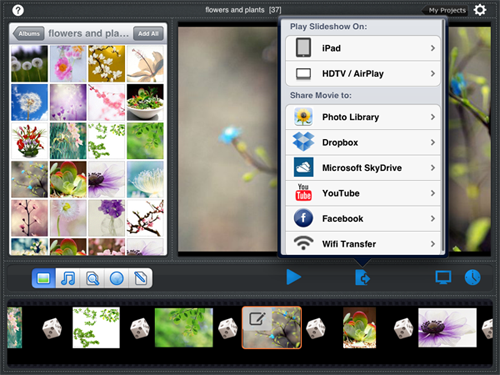 One of the greatest features of Photo Slideshow Director HD is the AirPlay support. With AirPlay feature, you can stream the stunning slideshow to your HDTV and speakers via Apple TV using WiFi. 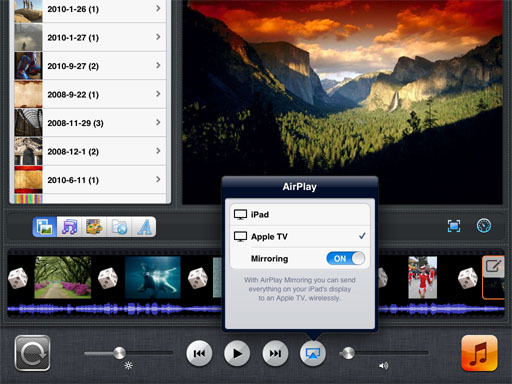 If you have an iPad 2 and Apple TV (2nd generation) with both iOS 5 installed, you can use this easy guide to activate AirPlay mirroring on your device and play the slideshow on big screen TV easily. 1. 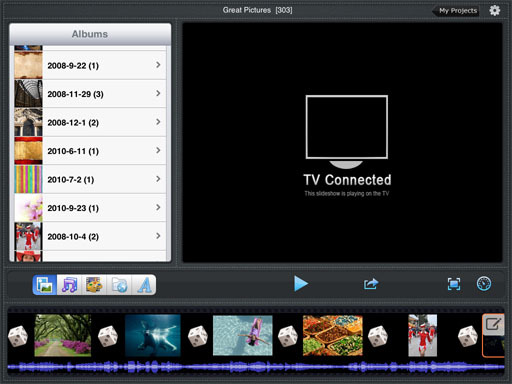 To use this feature, iPad 2 (and later) and Apple TV (2nd or 3rd generation) . It does not work on iPad1 and AppleTV1 . 2. iOS5(or latter) is installed on both devices. Step 1: Make sure that your Apple TV is on, and that it’s connected to the same Wi-Fi network with your iPad. Step 2: Double press the home button of iPad to bring up the latest used apps list. Swipe the multitasking tray from left to right, and tap the AirPlay icon. Step 3: Choose “Apple TV” and toggle the on/off slider to ON. Then your iPad screen will be displayed on HDTV. Step 4: Return back to Photo Slideshow Director HD app, tap the “Export” icon and select the “HDTV” item. Step 5: Now tap the play button, you can watch your photo slideshow on HDTV.